Canada’s Lauren Barwick finished on the podium today in the bronze medal position and earned Canada’s first medal of the Games following her Individual Championship Test during the fourth day of para-dressage competition on Thursday, August 28, at the 2014 Alltech FEI World Equestrian Games™ in Normandy, FRA. Riding Equine Canada’s 13-year-old Oldenburg mare, Off to Paris, in the Grade II Individual Championship Test, Barwick of Aldergrove, BC, finished with the bronze medal following a lovely ride, scoring 70.914%. Also competing today was Robyn Andrews of St Johns, NL. Riding her own horse Fancianna, a 13-year-old Friesian Andalusian cross, Andrews earned a score of 64.043% in the Grade Ia Individual Championship Test, which was good for 17th place. The competition wraps-up tomorrow, August 28, with the Individual Freestyle Tests for all Grades. 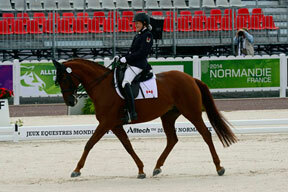 Canada will be represented by Barwick and Off to Paris in Grade II and Roberta Sheffield and Bindro T in Grade III. Both riders will be gunning for a podium finish. “Each Canadian rider has strengthened their performances every time they have gone into the ring, and we are thrilled to have Roberta and Lauren qualified for the Freestyle tomorrow. We are looking forward to some great results. Thank you to our all of our sponsors, funding partners, team supporters and our fans for their continued confidence in our team,” exclaimed O’Shaughnessy. Leading the Canadian Para-Equestrian Team at the Games is Amie O’Shaughnessy, Director of Para-Equestrian; Mary Longden, team coach; Andrea Taylor, team coach; and Elizabeth Quigg, chef d’équipe. The full team complement also includes Kerry-Anne Bourne, Lauren Massey and Emma Hale as grooms; Diana Andrews, Laura Dixon and Justine Bowers as athlete support; Sue McTavish as coach/groom; Caroline Archambault as RMT; and Anna Johnson, Para-Equestrian Coordinator. For a complete schedule of the Alltech FEI World Equestrian Games 2014, as well as full information and results, visit www.normandy2014.com. For a full list of Canadians competing at the Games, rider bios and more, visit www.equinecanada.ca/cet or download the new Equine Canada Mobile App – EquineCAN!